In 1919 Alfred Munnings, after the upheavals of the First World War and service in France as a War Artist, bought Castle House, Dedham in Essex. 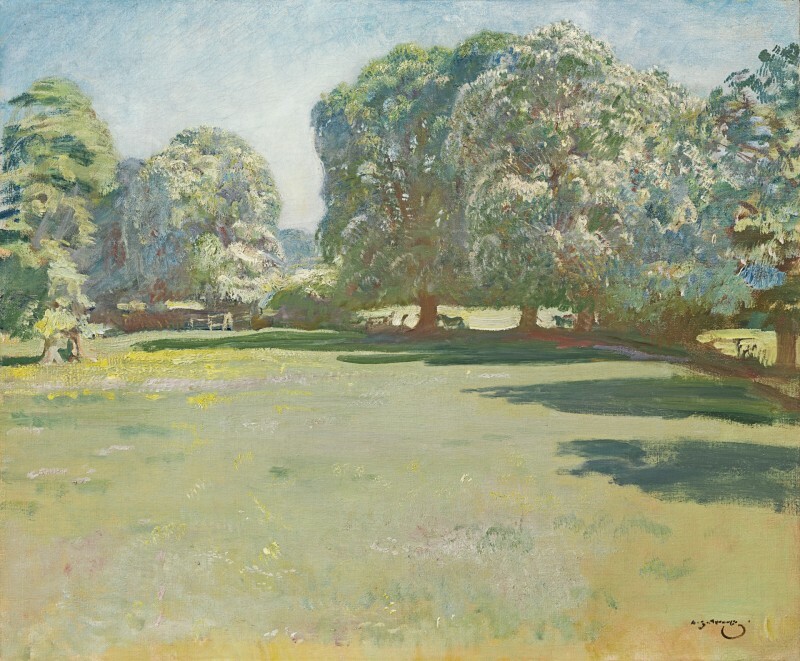 On the borders with Suffolk and near the River Stour, it provided elements essential to Munnings’s art and his whole existence: a tranquil rural life and a willow-fringed, meandering river with watermills like the one at Mendham where he had grown up. It had the additional advantage of being ‘Constable Country’, for the great East Anglian landscapist so revered by Munnings had been born in nearby East Bergholt. After the tragedy of his first marriage, also in 1919 Munnings met Violet McBride, who was to become his second wife the following year. Castle House, today the Munnings Art Museum, is a mellow, rambling building with a seventeenth century core and Regency additions. It came with about thirty acres of land which Munnings used as grazing for his horses. He set many paintings in the grounds, including My wife, my horse and myself (Munnings Museum). This view shows the lovely circle of chestnut trees that fringes the garden front of the house. Pure landscape painting, as opposed to lucrative but often frustrating equestrian portraiture, was very dear to Munnings’s heart, especially when he was painting familiar scenes. Here he captures a brilliant May morning with long, delicious shadows and the trees thick with white blossom. The vivacity of the brushwork and the myriad colours which Munnings draws out of nature reflect the artist as a true, observant countryman. One is pleased to note that the chestnuts still flourish at Castle House. The Munnings Art Museum has a photograph of the artist painting the present work. The museum holds another, smaller version of this view, with minor differences in the tree line and shadows, titled View at Castle House. Chestnuts in bloom at Castle House, Dedham was owned by Sir Harold Gillies, CBE, FRCS (1882-1960), the pioneering plastic surgeon who developed facial reconstruction techniques for servicemen injured in the First World War. It was later in the collection of Dorrance ‘Dodo’ Hill Hamilton (1928-2017), the billionaire heiress of the Campbell Soup fortune. Mrs Hill, who had homes in Wayne, Pennsylvania, Boca Grande, Florida and Newport, Rhode Island, was a major philanthropist in the fields of the arts, education, medicine, conservation and horticulture. Among many institutions, she supported Thomas Jefferson University, the Pennsylvania Academy of the Fine Arts, the Morris Arboretum and the Philadelphia Flower Show, at whose plant competitions she was a keen exhibitor for nearly thirty years. Inv. no.525. Oil on canvas 20 x 24 in / 50.8 x 61 cm. See Andrew Ellis, Oil Paintings in Public Ownership in Essex, London 2006, p.118, illus. in colour.